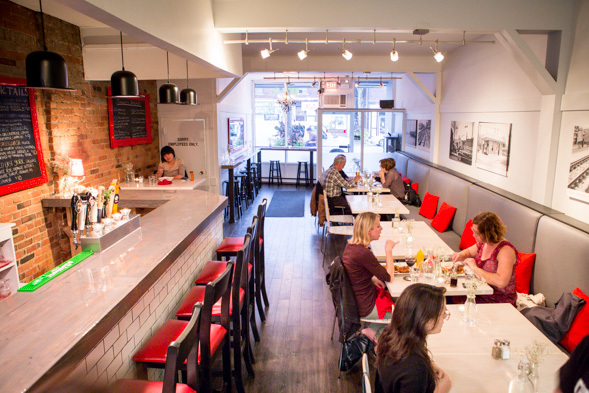 The Borough opened about a month ago on an up-and-coming stretch of Danforth East between Greenwood and Coxwell that has already welcomed places like Red Rocket , The Wren and Sweet Serendipity over the past couple of years. 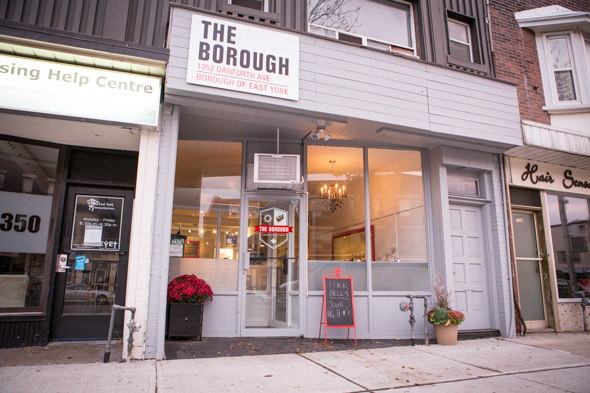 Those who live in the area seem excited about having this gastropub, named after the former borough of East York, as a new addition to the 'hood; it's been busy since its first day, when there was a lineup and an hour's wait for a table. Owners (and childhood friends since age 10) Richard Zimmerman and chef Jason Ashworth want their restaurant to be community-oriented. 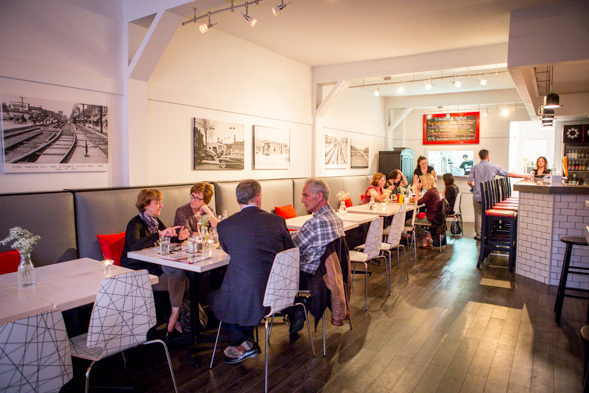 They also live in the area, and their enthusiasm for this part of the city is even reflected in the decor, where a wall is lined with old black-and-white images of the neighbourhood, sourced from the Toronto Archives. There is a huge emphasis on keeping everything as local as possible at The Borough; all the produce used is grown within a 100-km radius of the restaurant (in the winter, the goal is to keep the rate at 80-90%), and a blackboard by the kitchen lets diners know exactly which farms supplied the vegetables, as well as the hormone- and antibiotic-free meat for their meal. "Eating clean and knowing where your food is coming from is increasingly important to people," Zimmerman says (although hopefully not to this extent ). 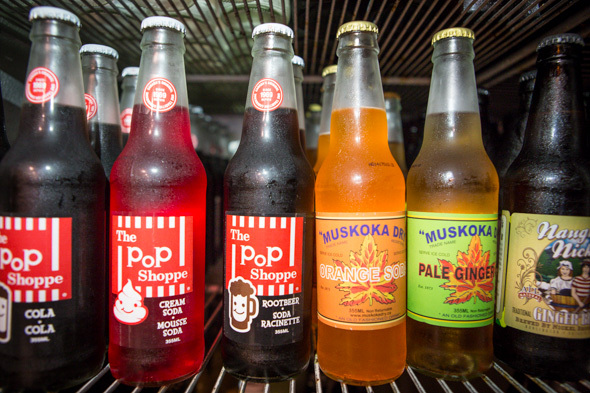 Even the drinks are all made in Ontario. 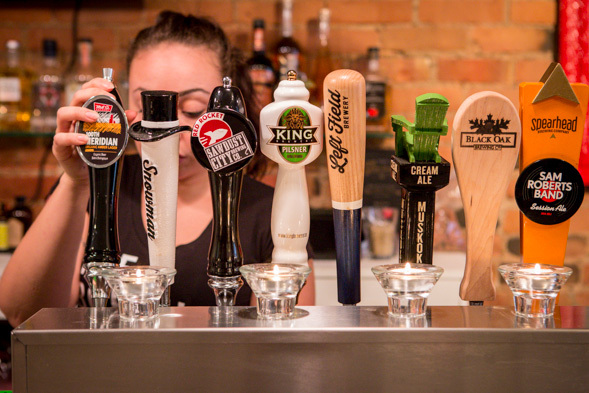 Craft beers on draught currently include a very tasty Red Rocket Coffee Stout by Sawdust City Brewing Co. and the Sam Roberts Band Session Ale from Spearhead Brewing Company . Wines are from Niagara and Prince Edward County, while cocktails are created with small-batch spirits and bitters from the likes of 66 Gilead Distillery and Dillon's . Zimmerman, who used to work at Bar Volo , is so serious about only using locally grown ingredients that there are no lemon or lime garnishes, "because they're not local." Zimmerman and Ashworth both spent time living and working in the U.K., which may explain why British comfort food is the fare served here. Ashworth cooked at The Garrison Public House in London, a highly regarded gastropub, where he was turned on to using quality local and seasonal ingredients. 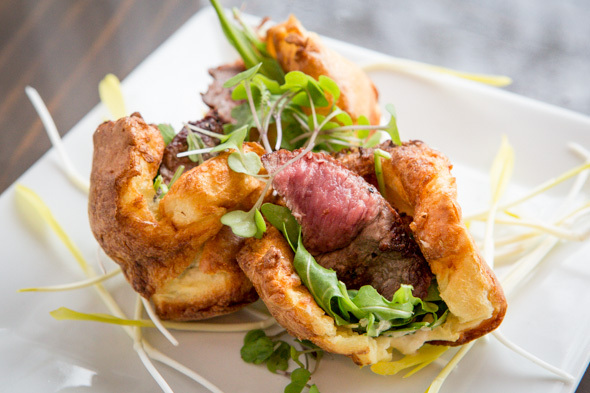 Mini Yorkshire puddings stuffed with seared beef, baby arugula and horseradish cream ($10) are flavourful, bite-sized versions of the quintessential English Sunday roast, and make for an appetizing starter. 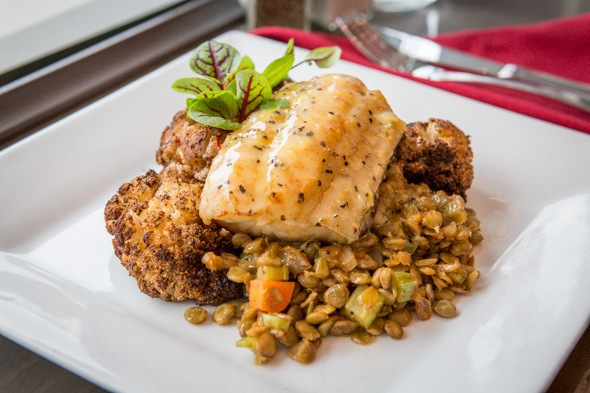 Veering away from the stereotypical British bangers and mash route as a main (although I'm told the house-made sausages are amazing), there is seared pickerel fillet with lentils, roasted cauliflower and a citrus beurre blanc ($21) instead. Another option is a centre cut pork chop with caraway stout mustard glaze, mashed potato and seasonal veggies ($19). The flavours are balanced and spot-on, and if you can handle spice, they're enhanced even more with Chef Ashworth's homemade hot sauce, made from peppers he's grown himself. 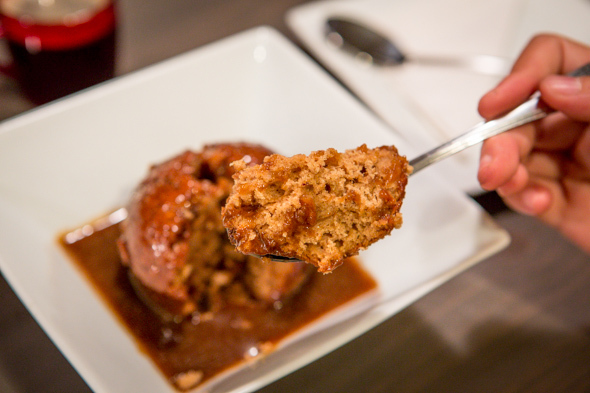 For dessert, it's hard to resist the cliche of sticky toffee pudding ($6), but hey - it's a classic for a reason, so why fight it? The Borough is currently only open for dinner, but it will soon offer weekend brunch as well as traditional Sunday roasts.